A new home near the University of Minnesota’s East Bank campus means new ministry opportunities for the University Lutheran Chapel (ULC), a congregation of the Minnesota South District of the Lutheran Church—Missouri Synod (LCMS). Just two blocks from its former location, the ministry now occupies an historic three-story structure along the University’s “Sorority Row,” in a building that has been renamed Luther House. The Rev. 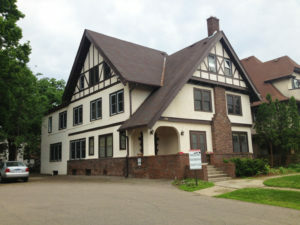 David Kind, campus pastor, said the structure, formerly the University Faculty House (a sorority house before that), and adjacent parking lot became available when real estate developers passed over it because of the historic designation of the building, which prohibits changes to the exterior. Now the facility, dedicated in April, houses offices of the university ministry, a library, lounge with fireplace, a huge dining room dating to the sorority house past, a basement game room, and six rooms on the third floor for rental to male students. Kind looks at the housing component as assuring lots of activity inside along with the steady stream of students walking and biking outside near the busy intersection of SE 4th Street and SE 10th Avenue. The flowing spaces of the ground floor feature refurbished, shiny hardwood floors and newly painted walls. The huge dining room with multiple tables serves as the location for a Wednesday evening Bible study that is preceded by a meal and followed by a prayer service. An international outreach program will resume in the fall with twice a week sessions. A Lutheran professor teaches the class in English. The course, which includes a spiritual aspect, can be an introduction to Christianity and Lutheranism for international students and is well-attended, according to Kind. University Lutheran Chapel now occupies an historic three-story structure along the University’s Sorority Row. For now the adjacent parking lot is just that. But nearly half the cost of a proposed new chapel building is on hand, and a professional fundraiser has been engaged. Kind hopes that within a year and a half, a new chapel will be erected at that busy intersection. He says that the anticipated chapel construction would be a milestone, marking the first church building project on the Minneapolis campus since the 1950s. Currently the ministry’s Sunday service is held at the Chapel of the Cross each Sunday at 10 a.m. on the campus of Luther Seminary, St. Paul. Beyond the students University Lutheran Chapel serves, the congregation includes about 125 non-student members. Many of them are in their 20s, 30s, and 40s and have long-standing ties to the congregation, often from their student days. There are also young children and some older members. Kind says the worship with its strong liturgical format is recognized throughout the country as a success while many campus ministries have moved in a different direction. 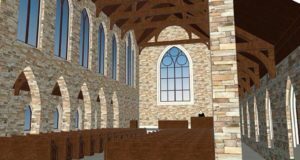 He says the university congregation demonstrates that one can be a “faithful Christian and still be effective.” He believes that nationwide recognition will be beneficial in fundraising for the new chapel beyond the local effort. Having the campus ministry at the University of Minnesota is reassuring to Brainerd Lakes area resident Tom Peterson, who has two sons at the university. He says the campus ministry is a blessing and makes him more comfortable about the environment in which his sons Elias and Matthew live. “It’s a safe haven, and both Elias and Matthew have made good friends through the ministry,” Tom remarked. His sons attend the Wednesday Bible study, movie nights, and other activities. 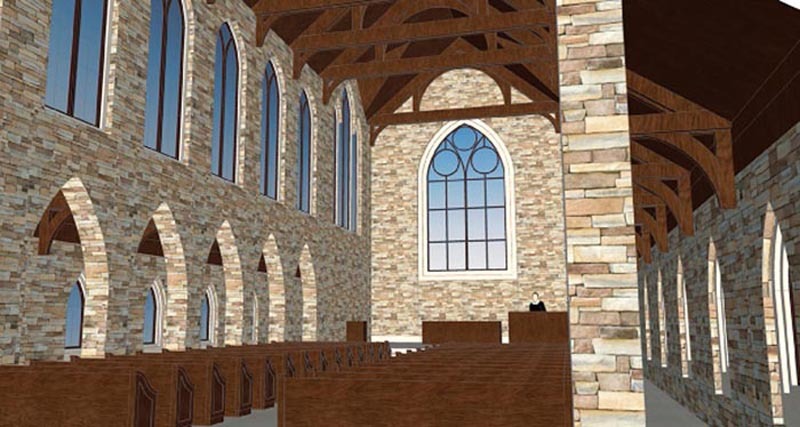 An architect's rendition of the proposed interior of the new sanctuary captures some of the old in a new space. Student Sarah Rose Battles commented: “A lot of times when churches want to reach young adults, I feel like their activities try to be as exciting as possible but end up being shallow. Pastor Kind and the ULC family work hard to make sure that not only are the student activities enjoyable, but provide quality teaching that doesn’t underestimate us. Here even the student movie nights result in theological discussions that occasionally go on until after midnight. After the new chapel building is available, Luther House will serve as a gathering place and classroom space. As the ministry settles into its new home, additional Bible studies are scheduled. Every other week there is a “Faith Goes to the Movies” night around the large screen TV in the basement game room, with discussions following the movie and how it relates to Christian faith and values. Once a month there’s also a patristics session, studying the church fathers. Pastor Kind, who has been at the campus ministry for 12 years and is a product of the University of Minnesota ministry, also does counseling and hears confessions. The former ULC site was sold in 2011 to a developer who converted it into campus apartments. The Minnesota South District planned to use proceeds from the sale to support other campus ministries, but delegates to its convention voted to use $2 million of the funds for a new ULC ministry site. 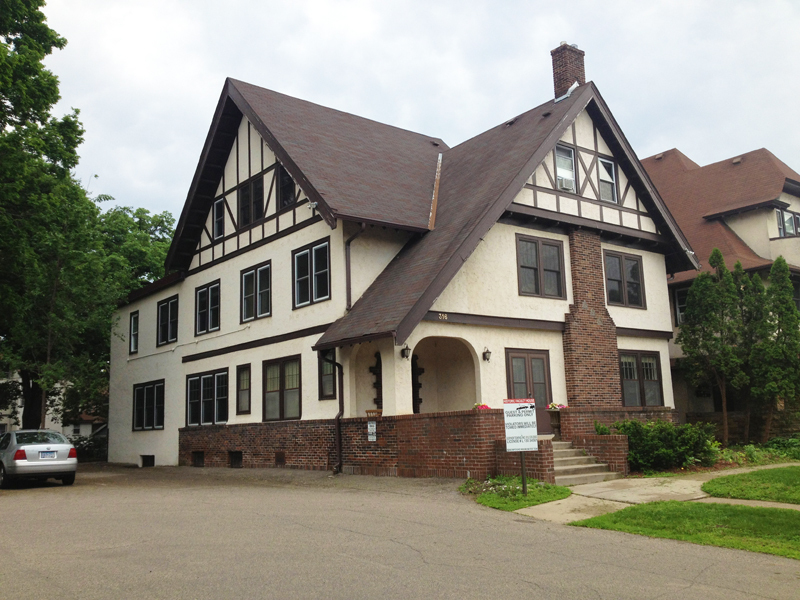 Luther House is located at 316 10th Avenue SE, Minneapolis. The phone number is 612/331-2747.